The mission of the Bonobo Conservation Initiative (BCI) is to protect bonobos, preserve their tropical rainforest habitat, and empower local communities in the Congo Basin. BCI is a non-profit organization based in Washington, D.C. and the Democratic Republic of the Congo (DRC). BCI is the only international organization solely dedicated to protecting wild bonobos and their rainforest habitat. Bonobos are one of humankind’s closest living relatives. These great apes are complex beings with profound intelligence, emotional expression, and sensitivity. The most unusual and compelling feature of bonobos is their society–matriarchal, egalitarian, and peaceful. The last great ape species discovered, bonobos could be the first to become extinct unless concerted action is taken now to protect them and their rainforest home. Bushmeat Hunting	Bushmeat hunting is the greatest threat to wild bonobo populations. In a region where more than 90% of residents can only afford to eat one meal each day, people are increasingly turning to wild sources for meat, both for sustenance and for profit in the commercial bushmeat trade. Congo War	The Congo War, which ended in 2003, claimed more than 5 million lives. Extreme poverty, degraded infrastructure, and social impacts have led to increased pressures on natural resources and wildlife. Agricultural Encroachment	Subsistence agriculture in the Congo region relies on slash and burn farming, which is the practice of cutting and burning trees and vegetation to clear plots for planting crops. This practice quickly depletes the soil of its natural nutrients and requires the clearing of new plots every few planting cycles, driving agricultural activity deeper into the rainforest and encroaching upon bonobo habitat. Lack of Information	Bonobos were the last of the great apes to be discovered and are still understudied. More information is needed about bonobo population size, range, habitat, and behavior to ensure their long-term survival. BCI’s guiding vision is the Bonobo Peace Forest, a connected network of community-managed reserves where both bonobos and their human neighbors can thrive. Our approach to conservation is fueled by the belief that local leadership is the path to effective and enduring conservation. Inspired by the collaborative and cooperative nature of bonobos, BCI developed the Bonobo Peace Forest concept in partnership with Congolese organizations and communities. The Peace Forest addresses conservation and humanitarian needs simultaneously. Today, the Bonobo Peace Forest spans over 50,000 square miles–and it’s still growing! Bonobos live in the heart of the Congo rainforest, the second largest rainforest in the world. Home to nearly half the plant and animal species found in Africa, this vast forest is critical to health of our planet. BCI works to protect this vital land through the creation of legally protected areas managed by local communities, creating contiguous blocks of safe habitat for bonobos. Protecting bonobos is BCI’s primary mission. Bonobos are humankind’s closest relatives, and they are on the brink of extinction. Collaborating with local and international partners, we are providing a safe haven for these amazing primates. We are hard at work expanding the Bonobo Peace Forest, a constellation of linked community-based reserves and conservation concessions. Humans are the greatest threat facing bonobos—and also the greatest hope. The Congolese people are the ultimate stewards of the bonobo habitat, and BCI seeks to build the capacity of Congolese communities. Our sibling species is in danger of extinction. 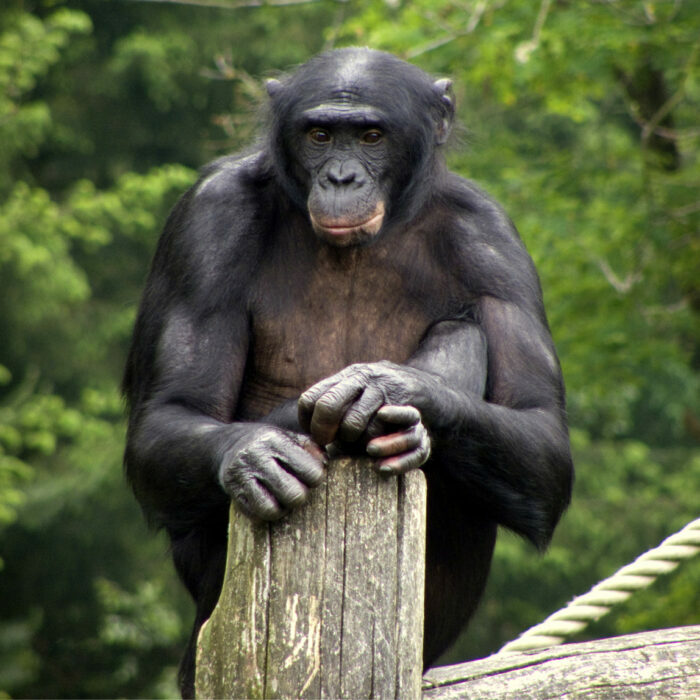 Poaching, logging, and agricultural encroachment threaten the dwindling bonobo population. Protecting bonobo habitat and studying this relatively unknown species are top priorities of BCI. You can make a difference. Bonobos need your help today!